� Abstract. The aim of this paper is to make a comparative study of the static behaviour of the eccentric presses, using the finite elements method, on the rigid structure respectively on the flexible structure. The finite elements modelling of the component elements of the presses are done in two ways: node by node link type (rigid structure) or using a linking element spring damper type (flexible structure). On this two structure is successively applied a number of static analysis, in aim to determinate the strain of working area and the design of the stiffness graphic. � Keywords: eccentric presses, finite element method, linking elements. � Rezumat. Obţinerea prin forfecarea de precizie a pieselor tubulare este cea mai eficientă metodă care asigură şi precizia şi productivitatea, dar totodată este şi cea mai economică. Realizarea acestei operaţii de debitare pe maşini universale (strunguri), piesa rotindu-se, cu o pregătire necostisitoare şi cu o mare flexibilitate, conduce la obţinerea unor rezultate la fel de bune ca şi forfecarea pe prese hidraulice sau pe maşini specializate complicate. � Abstract. The paper presents the functions and construction of couplings with blow-up tyre, used on mechanical presses, the equations used for calculus, and the steps of establishing geometrical and functional parameters that describe these couplings, conceived as module-subassembly. � Abstract. 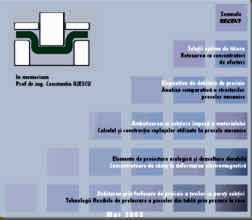 In the paper is presented the evolution of the research and the results concerning the conception of some devices for sensitive delivery of low diameter rods, spotlighting the imposed demands to these devices, and as well the technical creation methods used by the authors. � Abstract. The paper presents the concept of cup-drawing with intended thinning of the material, in its correct approach, considering the strain and deformation distribution. The theoretical and experimental research done by the author proved that the method is very efficient when processing hollow parts with thin walls, due to minimising the cup-drawing operations. It is also analyzed the precision of the parts which is higher than those obtained by usual cup-drawing. Some considerations about the device which can be used and about the values of the deformation degree which can be adopted are pointed out. � Abstract. The paper presents some experimental researches concerning shearing with concentrated strain of circular bars. It is shown the scheme of the shearing device, adaptable on an universal lathe. The device is equipped with resistive transducers for the measurement in two work phases of the stamping-breaking forces. The experiments permitted to outcome the variations of the stamping forces and of the breaking forces which are presented in some diagrams. � Abstract: In the paper is presented a C++ program which enable establishment of an optimal alternative in cut. To find the variant with maximum cut factor is used incremental rotation of the exterior outline of the part. � Abstract. The paper presents the peculiarities of cold-pressing technologies referring at the flexible automation of manufacturing. There are needed new fabrication proceedings, adaptable on forming machines with NC. The researches were oriented on two main directions: finding new generative processing methods, using tools with a form which do not depend on the part shape or materializes only partial its shape and finding some �flexible� forming tools, whom geometry can be modified for each part shape. The last part of the paper deals with the most important world achievements � fabrication methods, devices and tools � in flexible technologies for manufacturing sheet parts by cold-pressing. � Abstract. The enlargement of the working procedure�s application domain, through plastic cold distortion in electromagnetic field, requires the use of some intermediary elements between the tool coil and the semi-product, with the aim of conducting the electromagnetic field�s lines to a certain area. This paper studies the change of the electromagnetic field characteristics, which is caused by the placement of the field concentrator in the discharge circuit of the equipment involved in the electromagnetic field distortion. There are also presented several possibilities of producing the field concentrators and recommendations regarding their use. Abstract: The experimental modeling which was done allows a new appraisement of the cutting process in row superfinishing- outer rings, ball bearings, with a few important conclusions about the cutting time and the properties of the cutting fluid used. The proposed grade 3- polynomial curve offers a good estimation of the roughness and stock removal depth variations in time. Keywords: superfinishing, cutting fluids, bearing rings. � Abstract. The paper presents the computation methodology of an optimal lot of parts for launching in the manufacturing process under three concrete situations (cases) of the mechanical processing technological process. � Abstract. The relation between the building and the exploitation of machine tools, on one hand, and their impact on the environment, on the other hand, are approached in this paper, trough the angle of the consume of the materials and energy. The 10 rules of ecological conception, inserted in the paper, applied in projects can assure the sustainable development of machine tools building. � Abstract. This work represent a synthesis of an industrial environment degradation cause and at this implication about Romanian economy.